Relax! God put the wiggle in children; don’t feel you have to suppress it in God’s house. All are welcome! Sit toward the front where it is easier for your little ones to see and hear what’s going on at the altar. They tire of seeing the backs of others’ heads. Quietly explain the parts of the worship service and actions of the pastor and worship leaders, choir, ushers, and readers. Sing the hymns, pray and voice the responses. Children learn liturgical behavior by copying you. Remember that the way we welcome children in worship directly affects the way they respond to the Church and a life of faith, to God, and to one another. Let them know that they are at home in this house of worship. You may wish to let your child draw and doodle. They may even put their artistic offering in the offering plate at that point in the service. The presence of children is a gift to the Church and they are a reminder that the Church of Jesus Christ is a multi-generational body of Christ followers. Please welcome our children and give a smile of encouragement to their parents and caregivers. 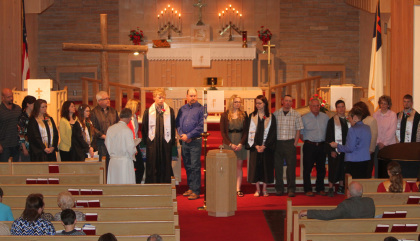 Welcome to Christ Lutheran and to the community that worships here. As we gather, we seek to honor God who calls us to worship in our life together and as individuals – children, youth, and adults. We cherish the light that each person brings to our time together. We hear again that God is a God of both the light and dark, and is present with us through all that life presents to us. We are reminded in worship of the Good News that Jesus brings to each of us as we proclaim that Good News when we sing and pray, listen and speak, confess and hear words of forgiveness, baptize, and are guests of Jesus Christ at the Lord’s Supper. Summer time worship from Memorial Day in May until Rally Day in September is on Sundays at 9:30 AM. From Rally Day in September until Memorial Day in May, our worship time is on Sundays at 10:15 AM. Our Sunday Morning Live educational hour for our three year olds through high school students is at 9:00 AM during the school year. On most Wednesdays throughout the school year, we have a time of fellowship over a meal, worship, and learning and discussion from 5:45 PM until 7:30 PM. We call this Wednesday evening gathering, “Mission Possible.” All ages are invited to gather and be fed physically and spiritually! We have Wednesday evening worship services at 7:00 PM during the six week season of Lent preceding Easter, and gather during Holy Week on Maundy Thursday at 7:00 PM and Good Friday at 7:00 PM to worship and remember the journey to the cross that Jesus made for our salvation. On Easter morning, we worship at our Sonrise Service and at our Festival Day of Resurrection worship service.